The Commission on the Status of Women at the United Nations states its policy goal as "Women’s economic empowerment in the changing world of work" (United Nations 2017). But what are the implications when we expand women’s economic rights? Property rights are central to capitalism's ability to allocate resources efficiently. The importance of economic rights on growth has been studied extensively, starting with La Porta et al. (1997, 1998). In one of the greatest victories of the feminist movement, common law countries such as England, the US, Canada, and Australia, began giving married women property rights in the second half of the 19th century, undoing the economic disadvantage imposed on married women by the common law doctrine of 'coverture'. At a social level, it is hard to overstate the significance of this revolution for women. It is perhaps rivalled only by procuring the right to vote. Focusing on the US experience, we use the end of coverture as a way to study the importance of property rights on the economy. We find that when women were granted economic rights it greatly expanded financial markets and increased economic growth (Hazan et al. 2018). Under coverture, marital property was divided into two types. Personal, or moveable, property. This was anything that could literally be moved, such as clothing, money, stocks, bonds, and – importantly – bank deposits. Upon marriage, this property immediately became the husband’s. Real property. This included houses and land, and came under the husband’s control but remained in the wife’s name. The husband could rent his wife's land and take the income, but he could not sell it without her permission. When the marriage ended (usually due to death) real property remained with the wife’s family. Consider the perverse incentives that coverture created. It would have been imprudent for a single woman to put money in a bank, or to hold any other asset except real property, because her future husband would simply take it away from her. Parents who wanted to give their daughters gifts or bequests would have been equally hesitant to put money in a bank, and would have used real estate instead. Less money deposited in banks would also mean that less money was lent by banks, an unfortunate outcome during the industrial revolution. We study the implications for financial markets on growth, but Kahn (1996) also found that women’s property rights led to further patenting by women while Geddes et al. (2012) found that these rights led to further investment in girls’ education. In a series of papers, Koudijs and Salisbury (2016, 2018) and Koudijs et al. (2018) studied the effects of related laws that exempted a married woman’s assets from her husband’s creditors, on risk taking, and marital sorting. 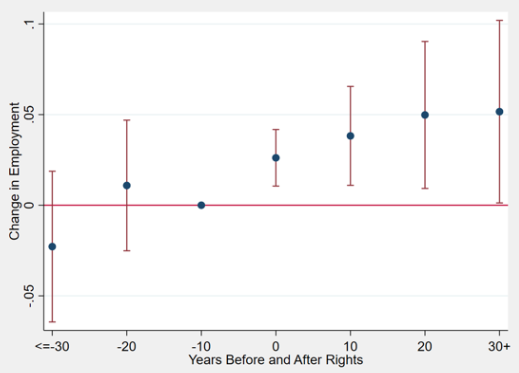 Married women were given property rights in the US state-by-state (Geddes and Lueck 2002), which allows us to compare economic outcomes in states that granted rights to those that did not. Massachusetts (1846) was the first state to give women rights. By 1920 all but four states had followed suit. 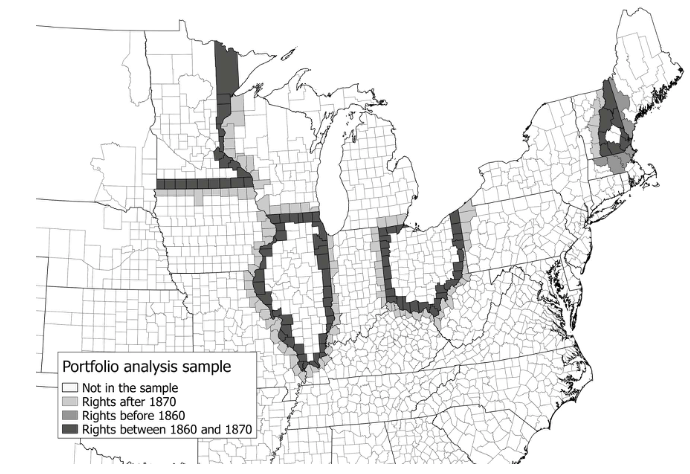 The US census asked about real property and personal property holdings in 1860 and 1870. Between these years, six states granted property rights to women. We discount Colorado and Wyoming, which were small at the time, and are left with Illinois, Minnesota, New Hampshire, and Ohio, and find that households invested more in personal property. Figure 1 shows counties in these four states that border other states. Consider a county in Ohio bordering a county in Pennsylvania. The people on each side of this border are similar, and thus serve as natural controls. Exploiting the fact that Ohio granted rights, we compare people’s portfolios on either side of the border. Source: Hazan et al. (2018), based on US Census data. We find that, after rights were granted, more people held at least some personal property (bank accounts), and more people held no real estate. On average, we estimate that personal assets increased by up to 15% after economic rights were granted. The Office of the Comptroller of the Currency is one of the US’s federal agencies charged with monitoring the financial sector. Its 1920 report shows deposits and loans from National banks by state and year, going back to at least 1865. After rights were granted, the growth in deposits and loans increased. Related data also show approximately an 80 basis point decrease in interest rates, a large change given the average interest rate was 8%. This makes sense; if people deposit more money in banks, banks lower the interest rates they charge borrowers so that they can lend the extra cash. Figure 2 shows this effect visually. We plot the interest rate in every state and every year, subtracting the national average in that year to control for normal business cycles. 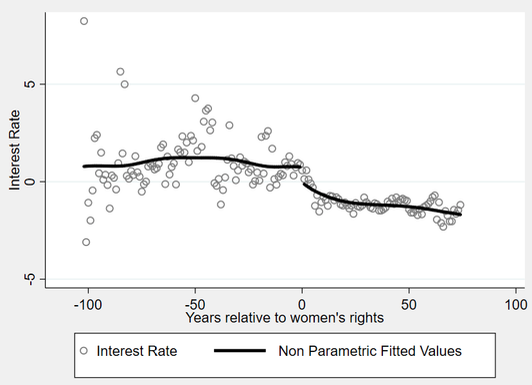 We then plot these interest rates relative to the year that a given state gave women rights. We see a significant decline in interest rates after rights were granted, consistent with an increase in the supply of loanable funds. Source: Hazan et al. (2018), based on data from the Office of the Comptroller of the Currency. If banks are lending more money after women are granted property rights, then we also expect to see greater industrialisation. Figure 3 shows how the effect of women’s rights on the fraction of a state’s male labour force dedicated towards non-agriculture (manufacturing). Source: Hazan et al. (2018). Before women are granted property rights, there is no clear trend. Afterwards, there is an increase in industrialisation. This result also holds when we use a similar strategy (described in Figure 1) for which we compare the borders of neighbouring states, one of which granted rights. Interestingly, we find that the growth in industrialisation was strongly biased towards industries that used more capital per worker, as measured by the 1850 census of manufacturers. It is hard to overstate the social significance of the end of coverture for women. What was perhaps unexpected at the time was the financial significance for markets and economic growth. Our findings are based on the experience of women in the US, but they show clearly how expanding economic rights to women, or oppressed minorities, can create economic growth. Geddes, R and D Lueck (2002), “The Gains from Self-Ownership and the Expansion of Women’s Rights”, The American Economic Review 92(4): 1079-1092. Geddes, R, D Lueck and S Tennyson (2012), “Human Capital Accumulation and the Expansion of Women’s Economic Rights”, Journal of Law and Economics 55(4): 839-867. Hazan, M, D Weiss, and H Zoabi (forthcoming), “Women’s Liberation as a Financial Innovation”, The Journal of Finance. Koudijs, P and L Salisbury (2016), “Marrying for Money: Evidence from the First Wave of Married Women’s Property Laws in the U.S.”, mimeo. Koudijs, P and L Salisbury (2018), “Limited Liability and Investment: Evidence from the Changes in Marital Property Laws in the U.S. South, 1840-1850”, mimeo. Koudijs, P, L Salisbury, and G Sran (2018), “For Richer, for Poorer: Bankers’ Liability and Risk-taking in New England, 1867-1880”, mimeo. Khan, Z B (1996), “Married Women’s Property Laws and Female Commercial Activity: Evidence from United States Patent Records, 1790-1895”, The Journal of Economic History 56(2): 356-388. La Porta, R, F Lopez de Silanes, A Shleifer, and R W Visny (1997), “Legal Determinants of External Finance”, The Journal of Finance 52(3): 1131-1150. La Porta, R, F Lopez de Silanes, A Shleifer, and R W Visny (1998), “Law and Finance”, The Journal of Political Economy 106(6): 1113-1155. United Nations (2017), Commission on the Status of Women, Report on the sixty-first session, United Nations Economic and Social Council..